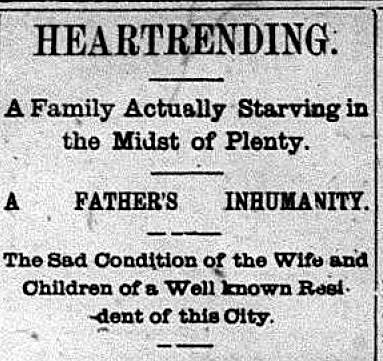 Times were tough in Missoula and the rest of the country at the end of the 19th-century. The economic panic of 1893 led to the country’s worst depression to date. Banks closed. Businesses failed. Farmers were in trouble. Layoffs and strikes led to thousands of unemployed miners and railroad workers. The city had a well-established county poor-farm for those unable to care for themselves. Now, it created a relief committee to sort out the true “needy” from the vagrants and slackers. The committee solicited cash assistance from the Missoula Mercantile company, Western Montana bank and other businesses and individuals. They also took donations of vegetables, sacks of flour, and clothing. Remarkably, after the vetting, an informal report revealed only 8 to 10 true cases of destitution in the city. All others were found to be falsely represented. The most outrageous case uncovered by the relief committee was that of the J. D. Walter family. Walter was appointed a United States commissioner in Missoula in the late 1800s. That’s equivalent to the job of a U. S. magistrate in the federal court system, these days. As a lawyer, judge, and notary public, he did alright financially, despite the economic downturn. He also drew a monthly pension as a Civil War veteran. But rumors began circulating in January of 1894 that things weren’t alright in the Walter household. Word was the judge had basically left his wife and four children in destitute condition, without food, clothing or warmth in the house. Walter spent his nights there but, comfortably, in a separate room. Mrs. Walter told reporters her husband wanted to be rid of her and the kids, using starvation as the tool to free himself from his burdensome family. A Missoulian reporter confronted Mr. Walter at a local restaurant as he was “tucking a good wholesome meal away under his vest.” Walter denied everything, claiming his family was being provided for sufficiently, and saying the whole thing was blown out of proportion by some meddlesome neighbors. The news articles triggered public outrage. The Standard reported, “…there are threats on the streets tonight against the old man if he does not care for his wife and children.” That prompted Walter to vacate the Garden city, post haste, for less hostile environs. But, exactly where the “wrinkled and decrepit piece humanity” went couldn’t be determined. It was speculated he may have taken his own life. Meantime, the city’s relief committee made sure the family was cared for. A couple of weeks later, a letter arrived for the family. It had been postmarked at Arlee the day after Walter’s disappearance, and contained $1.50. In late April there was a reported sighting of the mysterious, disappearing Mr. Walter in Salt Lake City, but the man was never again seen in Missoula.